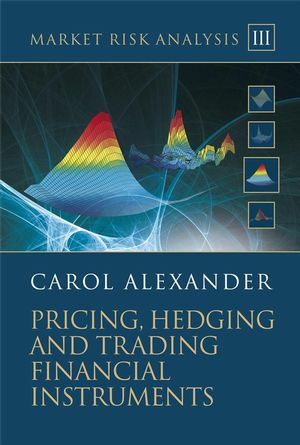 Written by leading market risk academic, Professor Carol Alexander, Pricing, Hedging and Trading Financial Instruments forms part three of the Market Risk Analysis four volume set. This book is an in-depth, practical and accessible guide to the models that are used for pricing and the strategies that are used for hedging financial instruments, and to the markets in which they trade. It provides a comprehensive, rigorous and accessible introduction to bonds, swaps, futures and forwards and options, including variance swaps, volatility indices and their futures and options, to stochastic volatility models and to modelling the implied and local volatility surfaces. Volatility beta mapping to volatility indices. III.1.4 Characteristics of Bonds and Interest Rates. III.1.6 Bonds with Semi-Annual and Floating Coupons. III.1.7 Forward Rate Agreements and Interest Rate Swaps. III.1.8 Present Value of Basis Point. III.1.10.1 Characteristics of Convertible Bonds. III.1.10.2 Survey of Pricing Models for Convertible Bonds. III.2.2 Characteristics of Futures and Forwards. III.2.3 Theoretical Relationships between Spot, Forward and Futures. III.2.5 Hedging with Forwards and Futures. III.2.7 Using Futures for Short Term Hedging. III.3.3 Characteristics of Vanilla Options. III.4.4 Modelling the Dynamics of Implied Volatility. III.4.6 Scale Invariance and Hedging. III.5.2 Risk Factors and Risk Factor Sensitivities. III.5.4 Applications of Cash Flow Mapping to Market Risk Management. III.5.5 Mapping an Options Portfolio to Price Risk Factors. III.5.7 Case Study: Volatility Risk in FTSE 100 Options.